Bexhill United's footballers produced what joint manager Ryan Light described as 'a fantastic effort' against higher grade opposition last night (Tuesday). Although a number of players were struggling with knocks, Bexhill led at half time away to Eastbourne Town before going down 3-1 in a Sussex RUR Charity Cup first round tie. Light said: "It was a game that was inconvenient to us really with so many unavailable and injured. We really were the walking wounded. "I said to them (the players) afterwards 'we asked a bit too much of you tonight, in normal circumstances we would've rested you and let you recover'." 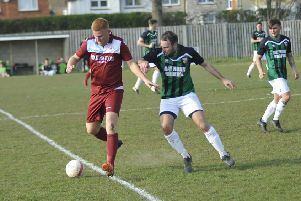 Last season's Macron Store Southern Combination Football League runners-up Town had just one shot on target in the first half as they struggled to get in behind a Bexhill side which looked dangerous on the break. Bexhill took a 27th minute lead through a coolly taken Craig Ottley penalty after Kevin Barden was wiped out by the goalkeeper in the side of the box. Town raised their tempo after half time and Bexhill couldn't quite match their intensity from the first half. Little holes started to open up in the Bexhill ranks as Town moved the ball quicker. Former Sidley United player Jason Taylor levelled in the 51st minute after Town got in between Bexhill's centre-halves, one of whom was 17-year-old Alex Trickett, who had a fantastic first half. Taylor struck again 14 minutes later to put Town ahead, getting to his feet having been down injured and slotting home. Bexhill felt, however, he should have been flagged offside. That proved to be the killer moment and Bexhill's injuries started to take their toll thereafter. Town grabbed a third goal in the 82nd minute when a cross sailed over Dan Rose and Evan Archibald headed home. Bexhill: Rose; Kidman (Willis), A. Trickett, McFarlane, Ottley; Cunnington, Robertson, Holden, Giles (Miah), Barden (Olujobi); Shelton. Subs not used: Gouet, Kane.